If you remember a while back, I said my family bought MAGNETIC PAINT. And well, here's the proof that this junk actually works. 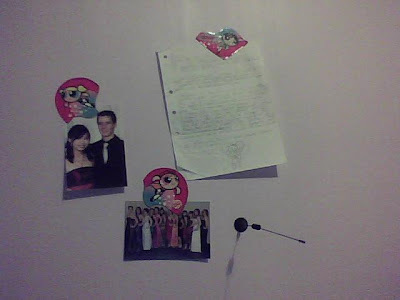 (btw: 1- I don't know what the black thing sticking out of the wall is, it just has a magnet at the bottom. I think $40 worth spent. I'm now trying to paint the backs of my cds with magnetic paint(that I normally bluetack to the wall) in hopes that it could stick up on its own...I gotta do another coat sometime soon. However, this is one story I did finish. Probably cause its only on a small piece of refill (what you see in the picture) and was maybe for school. High in the sky, a thing floated by. Not a bird, not a plane, not a U.F.O. It was Supermouse watching over the city of Yellowgrass Mountain. Supermouse was a mouse that could fly high above Yellowgrass. She was born in a sewer full of radioactive liquids. 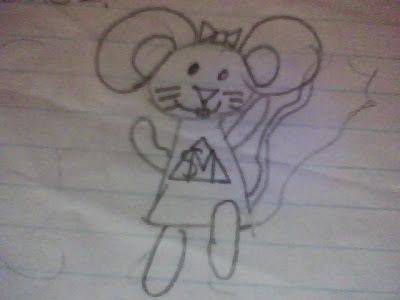 Developed super powers and became Supermouse. Today was like any other day untill the Giant octopus monster came. Supermouse sawed through the sky and gave the octopus a kick on the head. The octopus slapped Supermouse. Supermouse gave the Octopus her laser eyes, but it was to strong. She decided to give the Octopus a karate chop. She flew upwards into the clouds and flew down like a rocket. Then she hit the octopus in the middle of his head. And istantly it split in two. The crowd that was frorming chered and as the Japenese chefs came and served octopus sushi to the crowd. So Yellowgrass Moutain was saved thanks to Supermouse. Yeah, I was a brilliant child. That or I watched way too many Powerpuff Girl episodes. Nick Jonas and the....wait, what? Remember the days of flip book animations?